With accidentally apt timing for Halloween, Travis revisits his roots by reviewing a book he read for school, with Agatha Christie’s Hallowe’en Party. 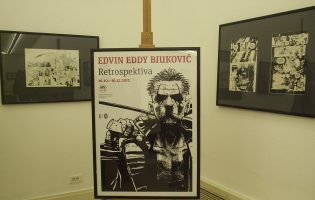 Continue reading"Actual Halloween Content: Agatha Christie’s ‘Hallowe’en Party’"
Continue reading"Sports wrap-up: 31 October 2017"
A few days ago (Oct. 26 to be exact), a retrospective exhibition dedicated to the career of the late, great Croatian comic book artist Edvin “Eddy” Biuković opened in one of the major art museums and gallery halls, the Klovićevi Dvori Gallery, in Zagreb. Continue reading"A Retrospective for Eddy"
Wrapping up the bookscouting road trip, including one of the more surprising finds we’ve run across in all our years of doing this. Continue reading"Backroads Bookscouting: North on Route 507"
I saw Thor: Ragnarok a couple of days ago, so I thought I’d do a quick and dirty write-up. It will contain spoilers for anyone who hasn’t seen the trailers. Continue reading"Thor Ragnarok quick review"
Hey, can we write about sports here? We can, because there are no rules? Excellent! Let’s get to it! Continue reading"Sports wrap-up: 24 October 2017"
The promised bookscouting column is coming, but in the meantime, you might enjoy these items of interest. Continue reading"Hatcher’s Junk Drawer #6: Sickbed, with Links"